AutoPot Watering Systems USA are specialists in self-watering systems, with emphasis being strongly placed on efficiency and preservation. AutoPot Watering Systems USA delivers products that are considered one of the most environmentally friendly watering systems in the world to domestic, hydroponic and commercial markets. These systems ensure this claim as the plant uses everything that is supplied to it; there is no loss of water, run-off or leakage! Why use an AutoPot System? There are a few things you must do before planting. The first and most important thing is to make sure you use the root control discs. You should use one for each pot. The root control disc is placed in the pot, gold face down. This root control disc will prevent roots from leaving the pot and heading towards the AQUAvalve. However it is prudent to keep an eye on any roots escaping and heading towards the AQUAvalve, if this happens, please simply remove the roots. This will not damage your plant in any way. You should use a filter with all AutoPot Watering Systems, it is very important that you check and clean the filter regularly. If it is a sponge filter that is positioned inside your reservoir, then it is advisable that you clean the sponge every time you refill the reservoir. If you use an inline filter it should be cleaned every 2-4 weeks. A poorly maintained filter can result in disrupted nutrient solution supply and even block the AQUAvalves. Generally, if you keep clean and make sure your reservoir and AutoPot trays do not get contaminated with debris, your AQUAvalve should work perfectly for the duration of your crop. If you are growing long term crops you should service your AQUAvalves every 3 months. A quick service involves turning off the water supply to your AQUAvalves and letting the plants use up the solution in the tray. Once the trays are dry and the valves have completed their wet/dry cycle, remove the AQUAvalves. You should also check if the yellow silicone in the top float needs resetting. To ensure that the AQUAvalve nozzle is unobstructed, use a paperclip or pipe cleaner and push through the AQUAvalve nozzle to remove any sediment. An ideal substrate for use in AutoPot systems is a 50% mix of perlite with either soil or coco. AutoPot Watering Systems have grown plants in a vast range of substrates from coral, to denim and pumice stone... we are now using the systems for aeroponic plant growth. WARNING: If using clay pebbles, whether at the bottom of the pot as additional drainage or as part of the mix, the clay pebbles must be pH stable. Be aware that certain brands are NOT pH stable and will increase the pH of the water in the tray dramatically affecting plant growth. If you are unsure whether your clay pebbles are pH stable, then the pebbles being used must be pre-soaked for a minimum period of 48 hours in pH water 4.5. This will stabilise the clay pebbles. Please ask your local store for further advice or contact AutoPot. *Clay pebbles should not be used alone as there is not enough capillary action in the clay pebbles to draw the water high up into the pot. Clay pebbles should always be used with additional substrates. Clay pebbles at the bottom of the pot can also be used as additional drainage if required to a level of 1”. Please ensure that the clay pebbles are pH stable before use. Always use a good quality soil or coco. Which ever substrate you decide to use, make sure its light, fluffy and free draining. 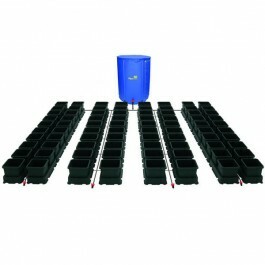 All AutoPot Watering Systems are extremely versatile and can be used with the medium / substrate of your choice. Whether growing in soil, coco, or hydroponically our systems exceed all expectations.